Welcome to my blog. I will take you through the transformation of my craft room and then into my world of all the different crafts I do. Some I will be learning along the way, and others I have done for years. So please join me in my crafty journey. Hello Everyone!! Hey, I am getting better about posting!! It's only been a month since my last post....lol. I got my Silhouette Cameo about 3 weeks ago and finally got brave enough to take it out of the box today...lol. I think I did the same thing when I got my Cricut Expression too. I LOVE LOVE LOVE IT!!! Now, I love my Expression too, but this machine can do those itty bitty tensy weensy cuts that the E just putzes out on. I have been playing with the software since before I got the machine, and I actually bought the upgrade to the Designer Edition right after I got it so I could use svg files with it it. I have a ton of those since I have SCAL too. The free version doesn't have the svg capability. I am really anxious to try the print and cut feature with some digi stamps. I THINK you can print them out, color them in, then open the file again and cut them. At least from what I understand it should work like that. You might have to print and then cut first, then color. I do know you can color them in right in the software if you want, but I think that would kind of take the fun out of stamping. And then what would I do with all those Copics I bought?? I guess I will have to figure it all out..lol. While I love it all, I do think there is still room for improvement with the software, but I am slowly figuring out how to make it do what I want. I made a test cut and played with it for a while today. I was just using some cheap white cardstock from Walmart to check it out but it cut it like a dream. So here is my first cut!! Sorry about the glare. I had it stuck to my Nook cover, then the camera took 2 pictures and died...lol. If you look close at the flower centers they have little spiky thingers and the Cameo cut them perfect. I was impressed. I think this would be soo pretty on a card. And as you can see from my next picture I had lots of little helpers checking out the Cameo with me...lol. I am in a Mini Me swap with a group of girls and these are the dolls I have got so far. I am hoping to have mine completed and hopefully mailed by the end of the week . I will post pictures after the girls get them. Can't spoil the surprise because mine are definitely going to be funny...lol. The idea is to make the 5" dolls look like you and then you take them on adventures. It's just a fun kooky swap. I also got a file tonight from the Silhouette store for a pop up birthday card. My granddaughter is going to be 9 Saturday so I thought I would try to make it tomorrow for her. Wish me luck!! I will post pictures of it when I get it all done. I am nervous about making it because it will be the first card I have made in a long time and on a new machine too. I am sure it will be fine. Let's see. What else has been going on around here? The house is coming along pretty well. I am still seesawing about getting a housekeeper to come in though. I am getting through it slowly but surely on my own and it is looking better and better every day. I do need someone to come in and wash walls and do the deep cleaning but other than that, I think if I keep plugging away at it, I will be fine. My 2nd grandson is going to be staying here while he is home from college this summer and he is an enormous help to me. He will help me finish setting up the 2 bedrooms and do some repairs I need done. I talked to him earlier tonight and he said he would help me rearrange the craft room if I needed him to. He is a sweetie. Oh!! I have 2 new roommates...lol. I am not real thrilled about them either, but it is turning out alright. Their names are Cocoa and Jade and they are my granddaughters cats. Cocoa is jet black and Jade is Siamese. Her Dad moved to an apartment where he can't have pets. My daughter can't have pets either. So guess who got stuck with the cats. Now how do you turn down those big brown eyes and a little girl asking you, "Gramma, will you please keep my kitties until we move again"...lol. Yes, I am a sucker when it comes to my grandkids. I think my daughter put her up to asking me though because I had been telling her NONONO!! I have no pets myself and I like it that way. My daughter couldn't find anyone else to take them and it was to the point they were going to have to go to the animal shelter if I didn't take them. I just couldn't do that to my granddaughter so now I have 2 cats for probably at least the next year. They are both about 7 years old and fixed and actually very well trained. They really don't get up on the furniture and I have NEVER caught them on my table or counters. I did have a problem with them digging in my houseplants at first but I fixed their little wagons. I went to Home Depot and got a bag of rocks and put them on top of the dirt. Problem solved...lol. My problem is the cat hair. They are shedding just clumps of hair all over my floors and making a ton of work for me trying to vacuum it every few days. My daughter is supposed to come over this weekend and give them baths and get them brushed out real good so hopefully that will help. As much as I hate to admit it, they do make me laugh every day with their antics. My daughter told me Jade was the dumbest cat she has ever seen and boy is she right...lol. OK, I am going to try to be better about posting. I will post the birthday card after I finish it and my Mini Me doll after I get them mailed out. I am sure that I will have a new project for you every now and again too since I have this new machine and I actually am hoping I can maybe do some designing on my own with it eventually. Ok, I am heading to Pinterest for a bit and then to bed. Night All!! I am definitely hanging my head in shame. It has been almost a year since I have posted on my blog. Where has the time gone?? I have made progress and had setbacks, but am now in the making progress stage again. Hopefully. Setback - Last May my daughter moved in with me, along with my grandkids. She has 5 kids, but 2 are in college, so it was usually 3 or 4 kids here at any given time. In a 3 bedroom, 1 bathroom, 1000 square foot house...lol. You can imagine the chaos. But, we all survived it and did the best we could with what we had to work with, and she was finally able to get her own place last month. 9 long months later...lol. I was babysitting for her while she worked a bazillion hours so not a lot got done in the craft room. I didn't even have time to make anything much. That's ok though because I got to spend a lot of quality time with my Grandkids, which I really enjoyed, for the most part...lol. Setback and then Progress - To top it off, we ended up packing up my desk in the craft room and moving it into the garage, and then moving the fridge and freezer into the craft room where the desk was. I like it because it is soooo much easier for me to access them and we needed the extra fridge and freezer space closer at the time. I also packed up the shelves above them and they now hold all my small appliances. Food processor, slow cookers and the like, plus I have extra storage for paper and canned goods if I need it. It really cleared a lot of space in my kitchen so that was a big plus too. More about the desk still in the garage later. More progress!! I am mobile again!! Last month I came into a little money and got a new to me vehicle. I haven't had a car for almost 2 years. Not since my 99 Suzuki Vitara bit the dust. While my daughter lived here it wasn't a problem because I could use her car if I needed to. The money came at the perfect time, right before she moved out, and I found the perfect vehicle for me. Most of you know I have mobility issues because of severe arthritis and I am also on oxygen 24/7. I can't walk very far and I can't stand for more than 5 or 10 minutes at a time. I use a cane or a walker if I am in really bad shape or go somewhere, but my house is small so I can pretty much get around it without anything. I have an electric scooter but it has been sitting in the garage since my Vitara died because I had no way to haul it and it is too big to use in my little house. Not having a vehicle, or the use of my scooter, had pretty much made me housebound. I couldn't go anywhere that didn't have electric carts and not many places have them. I now have a 2001 Chrysler Town and Country Minivan with an Entervan package. In other words it has an electric ramp on the passenger side and I can drive my scooter right up into it. And of course I ended up putting new batteries in the scooter too since it had sat for so long but I LOVE LOVE LOVE all of it!! I was really worried about having to struggle with portable ramps and getting the scooter in and out of a vehicle. This is perfect!! It is a little older than I wanted to go, but I got it at a good price and it only has 65,000 miles so I am really happy with it. I am happiest that I have my mobility back. I can go just about anywhere now!! WOOHOO!! Setback - Ok, so now my daughter and the kids have moved out. Which is actually progress, but I have spent the last 3 weeks trying to declutter and clean my little house. There were piles and piles and just "stuff" sitting everywhere. It was a disaster and I was even having a hard time getting through it all. I don't live like this and it was driving me nutso!! BIG setback...lol. Progress - I have 2 pretty much empty bedrooms. All that is in them is dressers and some things I set in there to get out of my way. I have mostly worked on my kitchen, cleaning out cabinets and drawers, but my living room and bath are starting to look good again too. I figure one more week and I will have those 3 rooms as done as I can get them. My big plan is to hire a housekeeper to come in and start washing walls, ceilings, everything, and then eventually it will work into where she will come in a couple times a month and just do the things I struggle with. I know it sounds funny, I have to clean before I can bring someone in to clean, but it wouldn't have been worth it to have someone come in and move piles from one spot to another to clean. Again, I have been doing a big purge and getting rid of a lot of things. I have a big box I am putting everything I find that is my daughters or the kids', and I am finding lots. Simplify, that is my motto now since it is getting harder and harder for me to take care of it all. Setback - The 1st bedroom. The one bedroom where all the bins used to be isn't bad. I had it painted and new carpet put in before I put all those bins in there so it is still like new. My daughter and granddaughter shared this room so it stayed in pretty good shape. I just need to clean off a few fingerprints here and there and maybe shampoo the carpet. This is going to be what I am calling the Den. After I get it cleaned I am going to put the desk that has been stored in the garage in there along with a couple of bookcases and maybe some shelves. There will also be a futon, a long dresser, the tv I have in the living room right now and the kids game systems I have. I liked the idea of a futon because it can be a small sofa normally but if I need an extra bed I will have one. BIG Setback - The 2nd bedroom. This bedroom needs a major cleaning and probably painting. I had rented this room for years before my daughter moved in and then the boys shared it after. Boys, especially teenage and preteen boys, smell and are messy...lol. The carpet looks like it is in pretty good shape but definitely needs a good shampooing. This room is going to be a guest room. I already have dressers, a tv and some bookcases for in there I just need to buy a bed. I gave my daughter the canopy bed I used to have in there because it was just way too big for my bedrooms. I am actually thinking about putting the mattress and box springs I have now in there and getting myself a pillowtop or an adjustable bed. I want an adjustable really bad because I sleep sooo much better propped up with my lung problems, but it is hard finding a full or queen size that isn't thousands of dollars. I definitely don't want a twin. So as you see I have big plans. I decided the 1st of the year that this is the year I get my house and yard together. I am normally a highly organized person and I WILL be organized again. I need to get my sprinkler system running again this year and get my yard back in shape too. My 17 yr old grandson wants to work for me this summer and will get the yard in shape like how I want it and between me and a housekeeper I will be able to get this house done and more manageable for me. So, have you noticed that I haven't really mentioned the craft room itself?? Welllll, it has suffered a definite setback this last year. Everything I had unpacked and organized is still there and in good shape, but all the boxes from moving the desk into the garage and clearing the shelves above it are still sitting in it. I am sooo sick of moving them around to get at all my stuff, and putting things away is almost impossible. Right inside the door in front of the needlework shelves has become a catch-all again. It is a disaster. BUT, I have somewhat of a plan. Once I get the desk moved into the den and the bookcases and furniture all set up, all those boxes will be in there to be put away. That alone will be a MAJOR improvement since that's the worst of it. After that it will just need a good cleaning and I will be back in business. OK, I have rambled and probably done a years worth of posts all in one here. But, that's what I have been up to. Hopefully this year will bring about the changes I need to make and I can get back into my crafting. It has been a long journey and I see nothing but good things and PROGRESS coming up. Wish me luck. I am going to need it...lol. Boy, there is sure an uproar going on over on the Cricut message board, any Yahoo groups related to MTC & SCAL, and anything Cricut related on Facebook. I have been reading it all with great interest as I am an owner of the SCAL software, about 43 Cricut Cartridges and a Cricut Expression. AND, I have kept my mouth shut up to now...lol. SOOOO, here is where I stand on the whole mess. While I have not always been happy with Prove Craft and some of their business practices as a company, I do love my Expression for what it is, a cartridge based system, and for what it does. I won't be tossing it all in a dumpster or selling it on ebay or joining any groups to boycott the company or to NOT boycott the company. I enjoy my machine and cartridges and hopefully can continue to enjoy them for many years to come. I bought all of it not even knowing about SCAL and MTC and loved it for what it was at the time, and my feelings have not changed. I will be keeping it and buying a few cartridges here and there even. I will probably even replace it when it dies. I also have SCAL. And I also enjoy the freedom it gives me to cut whatever I want. It is a good software program in and of itself and there are tons of free files out there that suit my needs and very tight budget. I have also played with the trial of MTC and like it also. It may possibly be a future investment for me as the budget allows. And I do use SCAL with my E. I bought it to use with my E knowing full well that PC did not approve and could, or would, block it at any time. That was the chance I chose to take when I invested my hard earned money into it. I KNEW what I was getting into and walked into it with my eyes wide open. Yes, I am definately a slacker when it comes to posting on my blog. I just went back and realized that 2 years ago was the beginning of this blog. And believe it or not, I am still working on that craft room. I guess I like to think I am a lot faster than I am...lol. Amazingly enough I have actually made some really good progress since I last posted. I have been pulling bins out of that back bedroom and scrubbing them down and getting them organized and labeled. All of my yarn and doll bins are now in the garage and I actually have a little space in the bedroom now. I have kind of looked through other bins and boxes and sorted them a bit too. My biggie is that one day last week I spent the whole day in the garage and got through every bin and box in there. I couldn't believe the things I found. I had one bin with Walmart bags full of brand new craft stuff that I never even took out of the bag. I guess way back then I was still buying craft stuff even though I never had time to craft...lol. I am glad I have it all now even though it is such a pain getting it all organized. And craft catalogs!! I'll bet I have tossed over 200 CATALOGS alone!! From the 90's to the present. Oh well. Sometimes I just have to shake my head and ask myself what the heck was I thinking keeping some of this stuff?? I am really liking the new setup in the craft room that I told you about in my last post. I have even done a couple of crafty projects and it works out perfect. Well, except I keep having to move stuff I am currently sorting through and working on putting away...lol. That makes it hard but I like the setup itself better. I have decided that instead of taking my time and going through that bedroom a little at a time or waiting for someone to help me, I am going to clear it out. It is physically too hard for me to carry those bins and boxes from that bedroom all the way to the other end of the house to the craft room. When my grandsons drop by I can usually get them to bring a few out into the living room for me and once I get them clean and ready to go into the garage that is where they sit until someone else comes over that can move them for me again. I feel like I always have a mess in my house and I am pretty tired of it. Not to mention losing the use of a bedroom for 2 years on top of it in a small house to begin with. SOOO, next Sunday I have recruited my family to come over and move all the boxes and bins out to the garage, where they will be right next to the craft room. Thus, why I got the garage all cleaned up this week. I told them for Christmas I just wanted a few hours of all their time to do this. I think this will help me as far as being able to get them in the craft room and gone through. AND it will contain the mess out there instead of having it strung from one end of the house to the other. I am kind of excited about it all actually. I still have a lot to do but hopefully this will make it a lot easier on me. I have always thought putting all of that in that bedroom was a mistake, but at the time we had already packed the garage full and there was just nowhere else to put it. When I think about it I actually have come a long way in the last 2 years. When we emptied that room I had stuff stacked in every room in my house and even some out on the patio. The garage was full, that bedroom was full, my house was full to overflowing...lol. Yes, I am a packrat...lol. But I am better. I am purging. I have 4 boxes ready to donate right now and have taken a few trips already to drop off boxes. I have given stuff away and donated until I am blue in the face and I am positive there is going to be much much more going out the door one way or the other. If it doesn't have a home, or I can't find it one without cluttering up my house then it is gone. Not everything is craft supplies but the majority of it is. My rooms are all cleaned out except that back bedroom too!! OK, I just wanted to let you all know I am still alive and kicking...lol. Not very high with this arthritis but kicking none the less. I am going to be really busy this next couple of weeks with Christmas and moving all of this but am going to try to post more in the new year. I have some projects I have done I need to get posted too. You all have a very Merry Christmas and a Happy New Year!! when it comes to my blog....lol. There really hasn't been much to blog about to tell you the truth. I haven't really been doing many crafts because I can't find most of my stuff. It gets very frustrating for me. It is all still buried in the back bedroom. I think when I go in the craft room to work on it, I tend to get overwhelmed really fast and I have to just walk away. Well, a couple of weeks ago I went out there and sat and just looked at it and thought about how it was working for me. I decided it wasn't working for me at all, and that was part of the problem. Soooo, out came the tape measure and the graph paper and I reworked the layout a bit. When I got the desk I had painted from my friend Manila last summer, I also got a big 5 foot table. I had wanted to put it in the craft room but coudn't figure out how to make it fit so it has been out on my patio as an extra table for barbecues. Well, it is in there now. I had originally wanted to keep the door clear going outside so I can open it in nice weather. Forget it. I can't get it open. I think it needs reframed and since that isn't going to happen for a while, you guessed it, that table is now in front of it. The big gray file cabinet that I was going to move to the garage is at the end of it. I had to move the Jet Max Cubes down about 8 inches for it all to fit. Since I had bought 4 more cubes that meant I didn't have room for my paper drawers at the end of them any more. I was running out of floor space along the walls!! Easy Peasy fix. My paper drawers are now on top of the big table. Plenty of room for them and still room in front of them to work if I need it. Plus I am liking having them right in my actual work space. As an added bonus I was able to fit 4 of my BIG sterlite drawers under the table too! I didn't think I was going to be able to put any of them in the room at all and I have 8 of them. Plus there is still room to store my big scrap tote and a couple of other things under there. Of course I had to go through them and sort everything all out and put it away where I wanted it, then scrub them down before I could reuse them. EVERYTHNG is sooo dusty and dirty. Not the contents, just the containers. So now my 2 craft tables are coming off the big table instead of the white desk. I still have a U shaped workspace, which I do like, and I can actually get the door to the front of the garage open all the way now. That is important because that is going to be the storage room for all those bins of yarn and "stuff" I have in the back bedroom. I have been working out in the front of the garage too. When I recarpeted my house a few years back I took my old living room carpet and just laid it on that cement floor out there. I love it. It comes up a few inches in front of the big garage door and it keeps it sooo much cleaner in there and a heck of a lot warmer in the winter. No drafts and I don't have to walk on that cold cement. Since we rarely open the big door it works out really well. I was thinking ahead when I did it because I knew eventually that would be my storage space for my crafts. A couple of weeks ago I got the freezer and fridge out there all defrosted and cleaned out and got rid of a few things that I was storing and just plain didn't need. I have a plan for that space and it is slowly coming together too. SOOOO, once I had everything moved where I wanted it furniture wise in the craft room, ( many thanks to my grandson DJ for helping me ) I had to go to work. I moved a lot of stuff and did a lot of rearranging, reorganizing and labeling. Then I brought 1 bin in out of the garage and started going through it. It almost overwhelmed me, but I stuck with it. I am glad I did because it was like opening a big Christmas present. About the top 1/4th of it was full of packages of brads of every shape and size known to man. I put them all in a box and set them with all the other brads and eyelets that I haven't organized yet because I KNEW I had a ton more "somewhere"...lol. Now if I could just find the cases I want to put them all in...lol. They are "somewhere" too. The rest of the bin was filled with paper packs that I didn't have any of in my paper drawers, and tons of stickers, tags, and miscellaneous embellishments. I was so proud of myself,. I dealt with every bit of it. AND scrubbed the bin down when it was empty. I am using my other 4 big sterlite drawers to sort into for right now since there is so much stuff and so many duplicates. I am putting what I am keeping in them and everything else is going in another bin that I will get rid of. I mean, c'mon, I don't really need 10 - 20 of each thing...lol. I have been doing some small RAK's to a few close friends and am doing a really big one in about 3 weeks at a Night Owl Swarm I am going to up in Denver. Those girls are going to LOVE me when I haul all this extra stuff in...lol. I am thinking I will eventually do some RAK's on this blog, but it will be a while. I want to have a lot more gone through and be a lot more organized before I will be able to. I almost have the end of my kitchen table cleaned off too. It was full of jars of bows, and just "stuff" I was sorting out a while back. 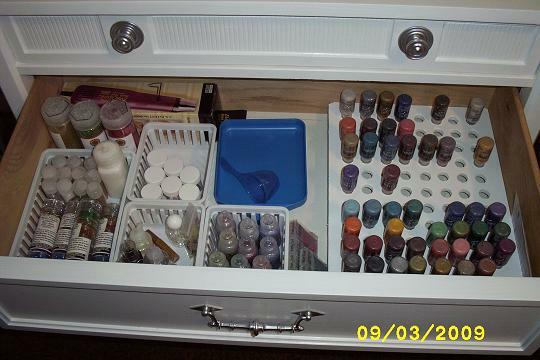 I am going to put all the jars on the Jet Max Cubes since I moved all my Cricut carts, mats and tools off of them into a drawer of the big gray file cabinet. I am taking the leaf out of the table since I am not going to be using it to sort any more. I can actually see my hutch in my living room again now too...lol. I have had them big drawers stacked in front of it for a long time and I no sooner got them gone through and everything put away than DJ put the smaller ones there that I went through today. After this everything will go straight to the craft room to be cleaned and sorted. My tables are all cleared off so there is room out there to do it now. I am tired of trying to clean around all this and my house looking like crap in general...lol. I am reclaiming my living space. So, that is what I have been doing the last few weeks. I have decided I am going to dedicate my weekends to the craft room and the rest of the week to the rest of my house. I am probably going to be spending some afternoons out there too. I have decided I need to get through the bins that are already in the garage first since I need the space to move the ones I want to store there. There are only about 10 or so and not all of them are crafts. My Granddaughter Tiana is going to love me, and her mother hate me, when I give her those 2 bins full of Beanie Babies and Buddies...lol. She is an animal fanatic so I think she will enjoy them and take care of them. She is 7 so I am hoping so anyways. I spent a lot of money on all of them at one time. I also know there are 2 bins of papers and just junk that will mostly go in the trash or the shredder. And "somewhere" ( there is that word again...lol ) is a bin full of my Xyron refills that I have been wanting and a bin full of Zig markers. Or maybe they are all in the same bin. I am not sure any more. I know one bin has more scrapping stuff in it because it was the one I was originally looking for. The rest of the bins are anyones guess. More Christmas pressies....lol. I hope. Hi Everyone!! I have another card for you today. I made this card for my Mother for Mothers Day and I think it came out pretty well. The paper and cardstock are from DCWV and I used my Cricut Expression and the Walk In My Garden cartridge to cut the flower pot and the bleeding hearts flowers. I wanted a softer look for the hearts themselves so I cut them in the pink cardstock instead of red, which is their natural color... I think...lol. I used a scallopped circle .cut file for Design Studio using the George and Basic Shapes cartridge from Okieladybug's blog here and adjusted the size to my needs. I used Stardust Stickles on the pink hearts and the pink part of the scallopped circles. The sentiment is from Studio G and the only thing I am not really happy with. The sentiment itself is ok, but I really need to expand my collection of ink colors and buy more sentiments for more occasions. I glued the part of the stem in the pot down and then pop dotted everything else for some dimension. The bow was from my stash. Hope you like it! This is a card I made for my granddaughter Tianna for her 7th birthday in April. It is only the 3rd card I have ever made and I don't think it turned out all that well. I figured, Oh Well, it's for a 7 year old and they are usually more interested in the money inside than the card itself...lol. I used my Cricut Expression for the cuts. The font is from A Childs Year and the Princess Cinderella is from Happily Ever After. The cardstock is Bazill Bling and I also used a lot of Stardust stickles to bling her up a bunch. Here is a picture of the inside. I forgot to take a picture before I signed it so pardon my sloppy handwriting. This is a layout I did for another Swap over on the Cricut Message Boards in March. I had to make 18 of these. I used my Cricut Expression with SCAL for the lettering, Walk In My Garden for the ladybugs, Independence Day for the eagle, and Everyday Paper Dolls for the little girl in her jammies and bunny slippers. She looks just like me, minus a few gray hairs...lol. The cardstock and rhinestones are from my stash and I used a Peachy Keen face stamp for the doll. I hand drew the glasses. I also took a silver pen and did a lot of doodling. Sorry, I had to cover my personal info for privacy reasons. Here are a couple more closeups. This is a layout I did for a Swap over on the Cricut Message Boards way back in September. It was our September swap but not due until December 1st. It was a Holiday Cookie Recipe Swap and I had to make 16 of these. I had a blast though. I used my Cricut Expression with SCAL for the lettering, and then Paper Doll Dress Up for the Gingerbread Boy and Girl, and My Community for the Gingerbread House. Stickles were my friend on this one because I think I stickled everything that could possibly be stickled. I also took a white opaque marker and did a lot of doodling around a lot of things. I thought it turned out fairly well. Here are a couple of closeups. Hi Everyone!! I am back and I am going to try to be a lot more consistent with my blogging. It just seems like the time gets away from me sometimes. I have been having a few problems with my disabilities and another personal matter, but things are better now and really looking up. I am working hard towards getting a housekeeper sometime in the next couple of months and that is something that will help me tremendously!! I do well with the day to day pick up, clean up, dishes, laundry and that type of thing, and if I can sit to do it great!! But, if it involves me standing for more than a very few minutes I just can't do it. Well, I can, but it takes me hours because I have to go sit so much. What I used to do in a couple of hours on a Saturday morning now takes me all week!! My daughter and I discussed it and I have come to realize I am struggling so hard to keep up my house I don't have time to do the things I actually enjoy. I have a craft room I have been trying to get together for a year and a half now, and while it is getting closer to being done it is going really really slow. I still have a ton of stuff to sort through and organize yet and I just feel too guilty going in there to work or create when there is so much else in the house that needs to be done. I have been able to make a few things in the last few months that I will be posting over the next few days. I am getting the camera out tomorrow and taking some pictures during the daylight. I usually take pictures of everything I make but somehow I missed a couple of things. I want to post them in the order I made them and of course the very first thing on my list doesn't have pictures...lol. 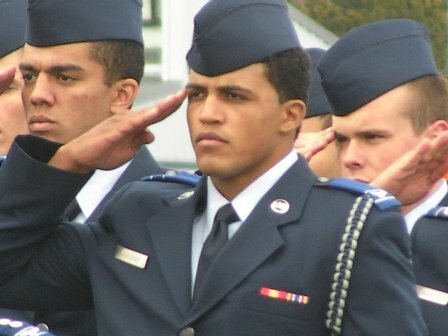 One thing I am very proud of, and doesn't involve crafts at all, is that my oldest grandson Devin (19) recieved his nomination into the United States Air Force Academy. He has been attending the prep school up there this last year as a cadet candidate and now come June 24th he will be a Freshman Cadet. His mother, my daughter, has done a wonderful job raising this boy and I couldn't be more proud if he were my own. I love you Dev!! Here is a picture, and yes, I am bragging just a little bit...lol. Hi Everyone!! I had 2 birthdays in December, My Mothers was the 12th and my Daughters was the 26th so I decided to try my hand at making a couple of cards. I have never made a card in my life so this was a whole new venture for me. After asking a bazillion questions over on the Cricut Message Boards ( Thanks Night Owls ) I decided to use some premade cards I had and just do the fronts. I made them both the same. I used SCAL to cut the font and I used Bazill Bling for the background. Everything else is from my stash. I did realize that I need to buy some sentiment stamps though. I hope you like them!! This first one had a bad glare on it so I took a couple of others. You get the idea!! Well, how about some pictures!! I am by no means done with the craft room but I have been making a lot of progress. I just have sooooo much stuff to clean and sort out and organize that I am starting to wonder if this isn't a lifetime project, and if I will ever be able to grab my coffee in the morning and go sit and just craft...lol. That is my ultimate goal but I don't see it happening anytime soon. If you have been following my blog since the beginning you know what a mess I started out with a year ago. We packed it all up and moved it mostly into my back bedroom and pretty much all over the house...lol. We painted and put up shelving and arranged and rearranged the furniture and changed our minds a ton of times...lol. Well, I have the all over the house part tamed now and have started on that back bedroom. OMG!! What a mess!! NEVER have 3 TALL teenage boys move boxes and bins into a room without CLOSE supervision...lol. I had to have one of them stop by one day just to get some of the stuff that was stacked ABOVE MY HEAD down...lol. Slowly but surely I am making some progress with it though. Some days it overwhelms me though and I just have to walk away. I just wish this cold weather would go away so my arthritis would let up some and I could walk a little better. It would sure go a bit faster I think...lol. So, here are some pictures. You can click on them to make them larger. This first one is a bunch of unfinished crochet projects and yarn I sorted out to go on my needlework shelves and in my yarn bins when I finally get to them. I am also scrubbing down all containers, drawers etc... as I go so this is actually more of a project than it looks. EVERYTHING is soooo dusty and dirty from sitting so long!! I am just glad that I was organized enough back then to containerize everything. Oh, this is happening in my living room...lol. These are my needlework shelves before I put all the above away. They were turning into a catch all since they are right inside the door from the kitchen. I nipped the catch all shelves in the bud though and got them all cleaned off and got everything put away on them. My sewing machine is on top with room to expand if I need it. Crochet books on the next 2 shelves down. Plastic Canvas books, yarn and canvas all on the next shelf. General Craft books and then Cross Stitch on the next shelf. Under the shelves it worked out perfect for my unfinished projects and a set of drawers to hold all my crochet hooks, knitting needles, sewing notions etc.. These are my scrappy shelves and Jet Max cubes. I have been labeling as I go and trying to organize them more but I keep finding more of what I have already done to add so decided I am going to get like with like and then organize it after I get it more together. The cubes on the left are actually going to go under the TV whenever I get one of my strong grandsons over to put them there for me. My shelves aren't necessarily going to be very pretty but they sure will be functional...lol. These are all markers etc.. that I got all sorted out and labelled. They are ready to go on my "Wet" Shelves.I am hoping I can find some more of these containers because I have a ton more buried in that back room yet. This is how I decided to do my stampers. I have all my wooden rubber stamps sorted and labelled in the clear containers by what they are. Then I have all my clear stamps in the zippered binders. I like them for the Studio G stamps but I am not thrilled with the binders for the bigger sheets of stamps. I am checking into CD or DVD cases instead. I have a few in some cd cases and I like it a lot better. You can see my paper/cardstock drawers on the left here and then this is what I call my "Wet" Area and shelves. Again, still a lot of organizing and work to do here too. My wet area will hold all my stamps, markers, inks, paints, anything "wet". I have 3 paint racks on the desk for all my little bottles of paint. and a whole lot of stuff to go on these shelves yet that I haven't found in that darned back bedroom...lol. OH, those are all my punches hanging on the door to the garage storage. These drawers are what I am working on now. Cleaning and sorting them out. I have 8 of them total and put 3 in the corner of my craft tables and put my Making Memories Carousel on them. I really want to keep these drawers because they are great for bigger things.I am going to see if I can fit them in next to the Jet Max cubes the TV is going to be on. We shall see. Just one of those drawers is full of adhesives. This is why I can't justify buying an ATG gun right now, though I would love to have one. I think I need to use some of this up first. I TOLD you I have a lot of stuff...lol. And THIS is all that is left to go through in that back bedroom. Thank goodness all the big bins will go into the garage storage. They just need cleaned up and labelled but are for the most part organized. And this is the little bit of carpet space I have won so far in that room...lol. It doesn't look like much but I am pretty proud of it since I haven't seen any of it in a while. I keep telling myself slow and steady wins the race, but boy it would be nice to have all this done. And that is my progress so far. I am trying to have the back bedroom cleared out by March 1st. I think I am going to call and see if I can get my daughter to come help me one Saturday. It is really hard for me to do all the carrying and moving the heavy stuff by myself and she is a great help. Plus if I can get one of the boys to help too that would be WONDERFUL!! Please leave me a comment and let me know what you think!! Believe me, I know I have a long ways to go yet but I have a good start!! WOW, it's been a while since I posted. Sorry about that. Things have been up and down around here and I am STILL working on that craft room. It's so hard when you have to have help with the heavy stuff and the high stuff too...lol. I hate being vertically challenged ( short ), but then I am a little ( lot ) horizontally challenged too...lol. Never-the-less I am still plugging away at it. The shelves are filling up with all my "stuff" pretty quickly. I am finding I am going to have to be highly organized to fit it all in there. I have been doing a ton of organizing as I am going too so that makes everything take 10 times longer. I just have so much I am wondering if I will EVER have this room done...lol. We did make one big step a couple of weeks ago. My Daughter came over and we cleaned out the front of the garage finally. I hauled a truckload of stuff to Goodwill and I have a few things I am going to get listed on Craigslist this next week when our weather gets better. I can finally get at all the bins that were hidden clear in the back on the shelves!! YAYYYYYY!!! But, I'm not going to drag them in just yet. I have GOT to get that spare bedroom cleaned out before I do anything else. It still looks exactly like it did last spring when we filled it up. You can open the door but you can't go in. I will be done with a swap in the next couple of days and then I am going to start pulling the smaller stuff out of the front of that room and dealing with it. My grandkids are out of school after the 18th and 2 of the boys said they would come help me empty all the bins out on one of their days off. They are all going into the garage, thus we had to do the garage first to make room. I bet there are over 50 of the big clear bins in there and tons of the plastic drawers too. We pretty much have it figured out how we are going to put them in the garage so I will have 2 aisles and be able to get at everything I need. I am just praying they will all fit like we planned or I am scrooged...lol. My goal is to have that bedroom all emptied out and cleaned by February 1st. It WAS January 1st but like I said. When you have to wait for help that makes it hard. OK, I am heading into the craft room to work on that swap. Have a great day!! Hi Everyone!! Well, I have been working my franny off in the craft room and I think all I am doing is making a bigger mess! I unloaded a bunch of bins and boxes of mostly books and magazines so now I have all that to get straightened up. I just set them up on the shelves that I wanted them to be on and I still need to sort through them and get them in magazine holders etc... AND I know I have more yet because I am missing several years of some scrap magazines I had subscriptions for. I think that is the most frustrating part of trying to put this room together is that everything is scattered and I keep finding more after I think I have it all together. I decided to get rid of that brown credenza and it now has a new home in a campground office up in the mountains. I got an old desk from a friend and decided I wanted to use it in my "wet" area where I will do stamping and decorative painting and things involving anything wet. The desk is the perfect size to hold my 3 paint racks and then still have room to work and drawers for storage. 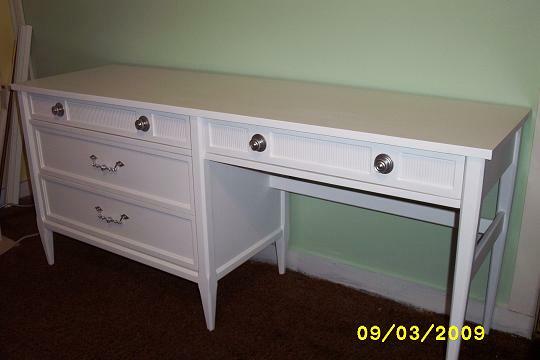 I ended up putting 3 coats of paint on that thing and still touching it up some because I didn't realize the drawers went in further than I thought. We spray painted the handles an aluminum color and I love it!! We got it moved in the other day and I started loading it up last night. I moved my Jet Max cubes to the yellow wall and right now I am trying to figure out a way to get my paper drawers to fit next to them so I can sit when I am looking through them for paper or cardstock. I think I have it figured out. Geesh...lol. Now I have to move the cubes down about 4 more inches. SO I just wanted to show you my new to me desk. 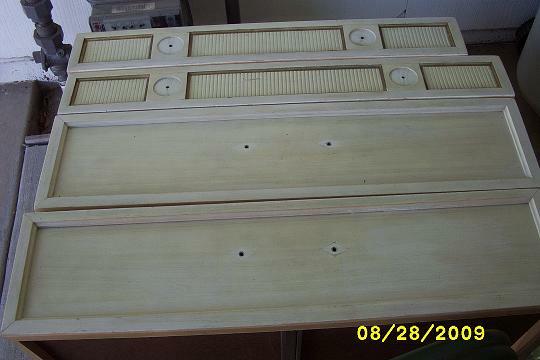 Here are the drawers before I painted them. I had already taken the handles off at this point and washed them down real good. The pictures of the desk didn't come out very good but the whole desk pretty much looked like this. And here is my finished product!! It turned out soooo good. I just love it!! And of course since it is going to be my "wet" desk it has to have the "bling" drawer. Of course I have already rearranged it a couple of times. OHHH, and my stickle holder I made!! Stephanie, from the Cricut Message Boards had made one and was courteous enough to share how she did it. I measured mine so it would fit in the desk drawer and I even have room still to expand my collection. I want to make another small one for on my desktop for the colors I am currently using. That way I can still keep them upside down. Plus I want to make one with bigger holes for the Ice Stickles. I have been busy making Mermaid tags for our little swap this month! I have been having a blast and decided to enter them in a couple of contests. Thank goodness for Oh My Crafts Stickles sale because I used a ton of them on these tags. Believe me, they are a LOT more sparkly than what these pictures show. I am going to have to go order more because I did empty a few bottles. Most of the cardstock and paper is from my stash or the open stock at Michael's. I also used the Dolly Dumpling Face Stamps from Peachy Keen Stamps. I love Peachy Keen and buy their stamps every chance I get. They are such nice people over there too. Ok, Here are My Mermaid Tags. All the cuts are from PPDU. I love all types of crafts which include scrapping, cardmaking, crochet, decorative painting, quiLLing, you name it and I think I have at least tried it. I am medically retired now so I decided I wanted to remodel my craft room. This is my journey of that adventure, and hopefully sometimes showing some of my work. I hope you enjoy my journey. Heartfelt & Handmade by Mari K.
→ Quer saber como ganhar dinheiro fazendo artesanato como a Cartonagem - Siga nossa canal e compartilhe esse vídeo! Clematis - Clematis. Acrylic on 24x36 inch canvas. This painting found a new home. We're on Facebook! - Visit our Facebook Page by clicking HERE. 50% off till shop closes on July 31st!!! - Two more weeks (approximately) till the store closes. 50% off all digis till then. So come on by to http://justsomelines.com/shop ! Throw Back Thursday! - Hello there. Today in Throw back Thursday, a stunning card by *Alyce Keegan*, digi: Hermione. Simple Flower Birthday Card - I got a new punch and had to try it out. It's for making flowers or edging paper. I am really pleased with the look. Now to dress up the cards more. 2011 Blizzard - We are all fine, just snowed in! Had to go out this morning for photos to scrap. Here is my favorite. [image: Photobucket] Pretty cool huh? Words to live by... - Love with no need to pre-empt grievance.